High-risk/high-return ETF portfolios are made up mostly of stock ETFs. After all, stocks have a very long history of clobbering most other investments — if you give them enough time. Any portfolio that is mostly stocks should have both U.S. and international stocks, large cap and small cap, and value and growth, for starters. 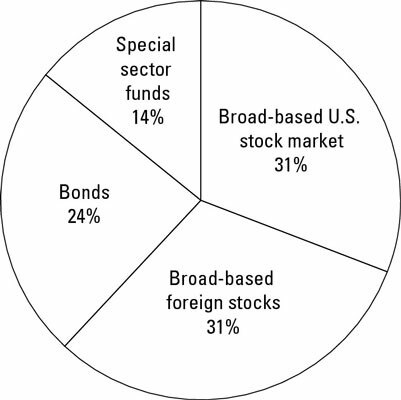 If the portfolio is diversified into industry sectors, a high-risk/high-return strategy would emphasize fast-growing sectors such as technology. Let’s consider the case of Jason, a single, 38-year-old pharmaceuticals salesman. Jason got burned badly by several high cost, load mutual funds that performed miserably over the years. Still, given his steady income of $120,000 and his minimal living expenses (he rents a one-bedroom apartment in Allentown, Pennsylvania), Jason has managed to sock away $220,000. Jason’s job is secure. He has good disability insurance. He anticipates saving $20,000 to $30,000 a year over the next several years. He enjoys his work and intends to work till normal retirement age. He plans to buy a new car (ballpark $30,000) in the next few months but otherwise has no major expenditures earmarked. Jason can clearly take some risk. Following is the ETF-based portfolio that designed for him. Note that Jason put four to six months of emergency money, plus the $30,000 for the car, into a money market account, and that amount is not factored into this investment portfolio. Also note that although this portfolio is made up almost entirely of ETFs, and one Pennsylvania municipal bond mutual fund to gain access to this asset class that’s not yet represented by ETFs. Municipal bonds issued in Jason’s home state are exempt from both federal and state taxes, which makes particular sense for Jason because he earns a high income and has no appreciable write-offs. New York and California were the only two states with their own municipal bond ETFs. In time, and probably sooner rather than later, there will be others. Finally, although this portfolio is technically 76 percent stocks and 24 percent bonds, 4 percent is in emerging market bonds, which can be considerably more volatile than your everyday bond. As such, don’t really think of this as a “76/24” portfolio, but more like an “80/20” portfolio, which is just about as volatile a portfolio as even the most aggressive investor should consider.